In 1999 the science department at NASA conducted a study on lightning, ground voltage and structural impact. A building in North Carolina USA, located within 45 meters (50 yd) of a 42 meter (45 yd) water tower was used in the study. Within a five month period, five separate lightning discharges occurred in the area. Unfortunately, this kind of damage to unprotected equipment is not uncommon. The National Lightning Safety Institute estimates that damage of this nature cost companies and individuals between $4 and $5 billion USD annually. Further punctuating the risk of surge damage, the U.S. National Lightning Detection Network estimates an average of 25 million cloud-to-ground strikes each year. While the cost in dollars may be alarming, you cannot put a dollar value on human life. For example, the reliability of medical equipment is an absolute must. That is why many of the top manufacturers of medical equipment turn to B+B SmartWorx for their data connectivity requirements. Our standard off-the-shelf and custom-designed isolation solutions protect vital data and valuable equipment in the harshest environments. Lightning strikes are not the only sources of damaging high voltage surges. Transmission line surges, wiring errors, ground loops and internal complications can also cause transient voltage to run unwanted across networks, phone lines, serial communication systems and other equipment. A brief review of what causes the phenomenon of high ground voltage will be helpful in understanding how industrial locations can effectively protect themselves against costly electrical component and equipment damage. When a high surge of current is released into the ground by a lightning strike (or something similar, like a downed power line), the energy spreads out like a wave. Imagine a large rock being dropped into a still pond. The ripples are more frequent and intense at the point of origin, growing longer and less intense as the wave moves outward. Similarly, the ground potential at the release point can be hundreds of Volts higher that it will be even a few hundred meters/feet away. This difference in voltage levels is the cause of the trouble. As the current moves through the ground, it naturally wants to find a way to equalize and travel along the path of least resistance. An industrial building found along this path will be connected to the ground, have buried grounding wires, cables and other access points where the current can enter the structure. These wires provide an exponentially easier path for the high voltage to travel across and attempt to equalize. The result can be large amounts of current entering the building at multiple entry points. It should go without saying that the larger the structure, the higher the potential of transient voltage entering. The damage occurs when this high voltage hits equipment and components that are not capable of handling the sudden surge. The results cost over $4 billion USD annually in the United States alone. It is important to note that transient voltage, surges and ground loops have two primary paths they can follow: data lines and ports, and power supply lines. Both of these routes provide a “path of least resistance” for surges and must be protected. 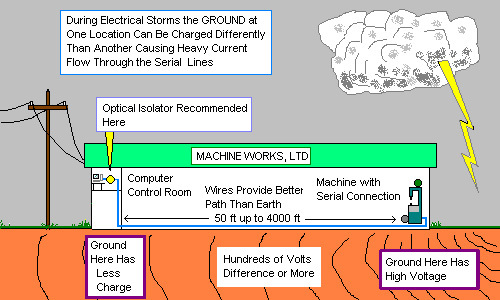 As described below, different surge protection components are more suited to protect these different paths. Suppression equipment comes in many different shapes, sizes and ratings, ranging from the simple power strip standing between your computer and your power source, to large capacity DIN rail mounted modules. B+B SmartWorx offers several heavy-duty, three-stage surge suppressors. Models HESP4DR, 485HESP, 422HESP, and 232HESP are B+B’s most popular and robust models. B+B SmartWorx also offers Ethernet surge protection with Model EIRSP1. A suppressor does just that -- it suppresses a surge and dissipates it before it reaches and destroys critical components. If you can imagine a large dam taking the brunt of a large wave and slowly letting it out through the spillway, you have a fairly accurate concept of how the suppressor operates. When used properly, or in conjunction with other protection measures, suppressors can be very effective. Suppressors are available to protect power and data lines, but are most effective when used as a first line of defense on power supply lines. B+B SmartWorx models can be DIN rail mounted or connected directly to a cabinet, with surge protection ratings up to 39 kA and less than 1 ns response time. • And, most notably, what if the “wave” is higher than the “dam”? This last concern – especially when dealing with large or rapid-succession lightning strikes – has been the demise of many “well protected” systems. Because of this, simply installing a few surge suppressors can sometimes do more harm than good. In all cases, those that need a robust solution to protect their data systems andmission critical equipment will need an added layer of surge protection on top of whatever suppressors may or may not be incorporated. Isolation – in varying degrees, depending on the method of isolation used – delivers this added safety net, providing maximum protection from transient voltage. Historically, transformers have played a significant role in isolating sensitive equipment. Unlike suppressors that stop surges of high voltage, transformers actually block the DC component of the surge. Transformers continue to work effectively in isolating systems that utilize modulated signals, such as phone systems and Ethernet communications, because of their tightly defined frequency ranges. Additionally, transformer isolation is essential in virtually all AC power transmissions, stepping the voltage down to an appropriate level. • Transformers are only effective within a narrow frequency range of their design. • High frequency “noise” is transmitted through the transformer and can corrupt data. • Excessive heat builds up when handling high surge levels that can damage equipment. • And transformers – even small ones – have a large footprint, consuming valuable spacein frequently crowded industrial environments. Transformers present another challenge in isolating systems using digital signals, such as those found in serial communication systems. Unmodulated digital data operates at an extremely wide range of frequencies, fundamentally making it incompatible with transformer isolation. 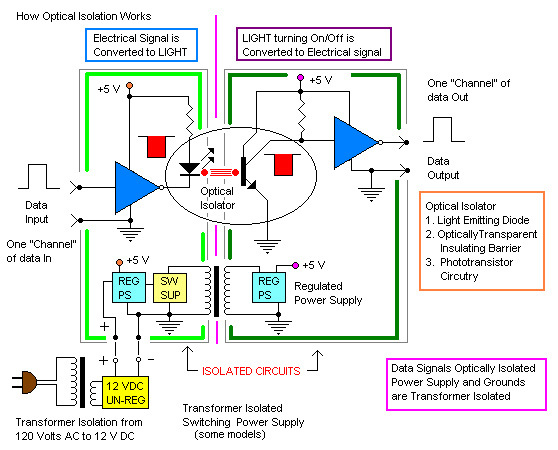 The concept behind optical isolation is a simple one and solves the vast majority of data transmission isolation problems presented by transformers and surge suppressors. Data is brought into an isolation module and converted into a light signal using a tiny light emitting diode (LED). This signal is picked up by aphoto diode receptor within the same isolation module and converted back into its original form. The physical gap between the light transmitter and receptor provides the needed isolation from transient current. B+B SmartWorx offers optical isolators for virtually any serial protocol. Serial Isolators include DIN Rail models 232OPDR and 485OPDR and a range of in-line isolators. Triple isolation simply extends isolation to each data port as well as the power supply, ensuring a completely isolated system. Inside each module, circuitry is strictly separated, with no electrical connections between any two ports of the board. This requires that a second, isolated power supply be internally generated in order to power the circuitry of each port of the board. This kind of isolation represents some of the highest protection you can enjoy in your equipment because it cuts off all available pathways for transient surges and ground loops. Most equipment that employs triple isolation should be able to handle voltages in the 2000 – 3000 range. B+B SmartWorx models 232OPDRi and 485OPDRi are ideally suited for situations requiring triple isolation. Transient power surges and ground loops can originate from many different sources, including transmission line surges, internal system configuration errors, and -- of course -- the most powerful source: lightning. Every year businesses and individuals suffer over $4 billion USD in damages because they have not taken the time to properly protect data and valuable equipment. Isolation devices, in their various forms, provide the needed protection. Are isolation devices more expensive than non-isolated models? Yes. For example, in some cases, an isolated component may cost $30 to $50 USD more than its nonisolated counterpart. But, what is the real cost? The triple isolation repeater effectively protects equipment located at both ends of the communication line. In most cases, there would be a PLC or a PC at one end with industrial manufacturing or data processing equipment at the other end. With PLCs running from hundreds to thousands of dollars and other types of equipment running from thousands to hundreds of thousands, the increase costs of isolation are relatively low. That being said, perhaps the most important cost-to-benefit factor to consider when deciding whether or not to isolate is production time. How much down-time can any given system or piece of equipment sustain before it begins to negatively impact production and revenues? In most industrial situations, down-time must be minimized and constantly guarded against to ensure profitability, good customer service and acceptable product delivery times. In the end, by isolating your systems – mechanically, optically or both – and by establishing “dams” to stop destructive “waves” by using surge protectors, you can enjoy maximum up-time and reduce repair and replacement costs due to unwanted power surges. Isolation is an essential investment that provides maximum protection while promoting maximum productivity and revenue. Deciding what should be protected by surge protectors and/or isolators and learning how to properly install the right equipment can be complex and frustrating. For this reason, B+B SmartWorx offers complimentary professional consulting. Any of our Technical Support statt or application engineers will be happy to discuss your particular situation and provide you with free, professional grade support and recommendations.